Expect the summary of the events around the Kamsky – Topalov match tomorrow on Chessdom.com. Hello Silvio, why are you here and not in Wijk Aan Zee? I was there the first three rounds, but had an important meeting with Vesela Lecheva about the semi final match Kamsky – Topalov. The idea is the match to take place in Veliko Turnovo. It is not a big deal that I will miss several games in Holland, the tournament is long and we will catch up. I will be there for the game with Anand on Sunday (editors note: live comments on Chessdom.com with GM Dimitrov). Are there news after the meeting with Lecheva? I informed Lecheva that there is big pressure from Kamsky’s side and his people. That is why FIDE will give them a chance to look for sponsors and the match to take place in the USA. It can happen in New York or Seattle. Even though FIDE had taken the decision the match to take place in Bulgaria, they decided to give chance to the USA to beat our offer by March 31st. It is 180 000 USD. FIDE wanted 150 000 USD for the players plus 20% for the central, and we agreed. Now Kamsky has to find a better offer as the minimum is 250 000 USD. In case the USA finds the money, we will have two months to equalize the bid. If we do it, the game will be in Bulgaria. In case there is a better offer from the USA by March 31st, will Topalov agree to play there? He will, if we cannot equalize the bid. We will not have any other choice. In any case I think there will be a lot of interest in the match in Bulgaria. Let’s wait and see if there is an offer from the USA, as sponsors are not easy to find and time is running. There is more audience for chess in Russia than in the USA. Is this the reason Kamsky to want Russian citizenship? I suppose the offer from Elista has something to do with it. Kamsky is disappointed there are no sponsors in the USA and maybe believes he will find more support from Russia. I think the citizenship is a light form of “blackmail” for the US sponsors. Better said, he is trying to press them. Why will it take two months to finalize the agreement? The Americans have to give a bank guarantee for the money and that is not easy at all. That is not like going to the store and buying cheese. If they cannot find money the match will be in Bulgaria. But if they find 1 million, it will be very hard to beat them. Our position is to wait for the moment. How do you find the offer of Kalmikya to organize the match? That is just PR for them. Everyone knows after what happened there, we will never go back to Elista. A free advertisment of Elista, that is all. Is there a possibility the game to take place in other place in Russia? You have to know that FIDE does not consider four countries neutral – USA, Bulgaria, Russia, and Spain. Is an offer from another country possible? It is difficult, but not impossible. Let’s wait and see. What type of person is Kamsky? We gave him a chance in 2006 at Mtel Masters, until then he was not receiving tournament invitations. He played very well at the Chess World Cup and deserved the first place. He left his home country when he was 15 because he did not have chance to develop there. A big tallent, but Russia is full of great players like him. He needed a chance to play at big tournaments. His father realizes he does not have a chance and they go to New York. 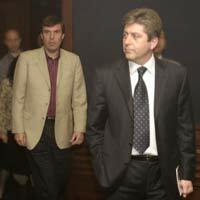 After unsuccessful attempts to beat Karpov and Kasparov, he left the attempts to conquer the World Chess Championship. He had a devastating loss from Karpov in Elista. Does his father have such a big influence over him? His father is an ex boxer. He is like the father of Mozart, pressing him all day long to work. The opinions on if he had positive effect on Kamsky are divided. Can we expect a manager clash between you and Rustam Kamsky? All the correspondence of Kamsky is done by his wife, she is an advocate. His father only talks in newspapers. I have not heard Kamsky saying his father is his manager. I had the impression they do not work together anymore. How will you comment Kamsky’s words that he will not play in Bulgaria? That is exaggerated. He said he preffers the match to take place in a neutral country, but if FIDE decides he will play in Sofia (Chessdom editors note: probably Turnovo). Gata and Vesko are good friends. In any case, if FIDE decides he does not have a choice and if he does not come he loses. Why is Vesko not doing well in Corus? He usually has difficulties at the start. He is not at top form at the beginning, but I preffer to talk after the end of the competition. 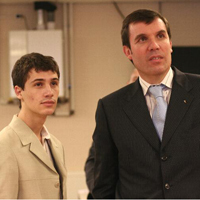 On Tuesday is Topalov Kramnik. FIDE said the players will have to pay a fine of they do not shake hands. I think there will be no shake of hands because nobody will give his hand first. And the preparations for the Mtel Masters 2008, how are they going? This year Mtel Masters 2008 we will be in the Military Club (Chessdom editors note: one minute away from Grand Hotel Sofia) where we will put an “aquarium” for the chess players. At the moment we are looking for a company to make the soundproof aquarium. 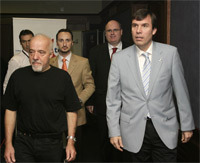 In the Chess Champions League in Vitoria it has been under construction for six months before the tournament. It is easier for us because we have the plans. It will be a big show! How much does the aquarium cost? Until now we have an offer for 60 000 eur, which is expensive. Can we expect other surprises from Sofia? This year Mtel Masters is a part of the Grand Slam together with Corus, Morelia Linares, and Mexico City. The winners will play a final in Bilbao, together with two more players invited by the organizers. One of them is Anand. Besides Spassky, we want to invite Karpov to this year’s edition of the Mtel Masters, but his program is very busy. I suppose we will take the Spaniard Francisco Paco Vallejo, who was in Elista as well. Cheparinov also needs a second. This will be the Dutch GM Erwin l’Ami. Is it possible Cheparinov to win the Mtel Masters? He is still young, 21 years old. But he can win Wijk Aan Zee Corus B, I told him now is his chance. He needs 3-4 more years of serious work to become a top class player. What will be the team with the match with Kamsky? I will take Dr. Kandilarov, who helped us a lot in the World Cup. For sure there will be Vallejo and Cheparinov, and many of the people from the team in Elista. How much time will you prepare for the match with Kamsky? If the match is in December, than it will take several months. In the end of September we stop with the tournaments. If the match is in Turnovo, where exactly will it take place?